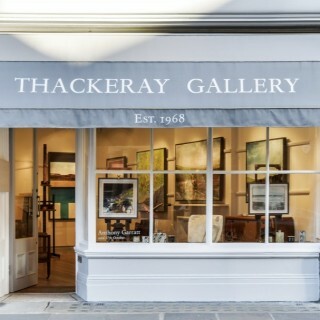 Working exclusively with living British Artists, Thackeray Gallery has been trading successfully for 51 years. Based in Kensington’s Thackeray Street, we have built an international reputation for excellence, quality, originality and uniqueness. Our Artists are very individual, highly talented and sourced from renowned Art Schools across the UK. Stylistically, the majority of our artists fall within the genres of semi-abstract, expressionist and contemporary. We have a strong eye for land and seascapes, as well as interiors and still lifes. Most importantly, each of our artists has their own signature style, making them stand apart from the masses. Our Clients are very individual too, many of whom have been collecting with us since 1968 and then passing the ‘bug’ on to the next generation. The majority of our business is ‘word of mouth’, ‘passing trade’ and continued loyalty from our long-standing clients. Where we are based, next to the delightful Kensington Square, is a local hidden gem of eclectic, one off shops and restaurants. We have been in this location since the Gallery began in 1968 – a stunning space with a warm feel – and have become a local destination over the years.